Palestinian football teams and NGOs have written to Platini arguing that holding the UEFA 2020 games in Jerusalem would be tantamount to “rewarding” Israel for its massacre of more than 2,100 Palestinians, including over 500 children, during its recent 52-day assault on Gaza. ”Giving Israel the privilege of hosting a major international sports tournament just weeks after it has carried out a bloody massacre of Palestinians in the besieged Gaza strip would give a green light to future war crimes,” said Abdulrahman Abunahel, the coordinator in Gaza with the Palestinian Boycott, Divestment and Sanctions National Committee (BNC). “Palestinians in Gaza enjoy the beautiful game as much as anyone else but Israel has launched a war on football, killing footballers, bombing stadiums and refusing to allow players to travel to matches. 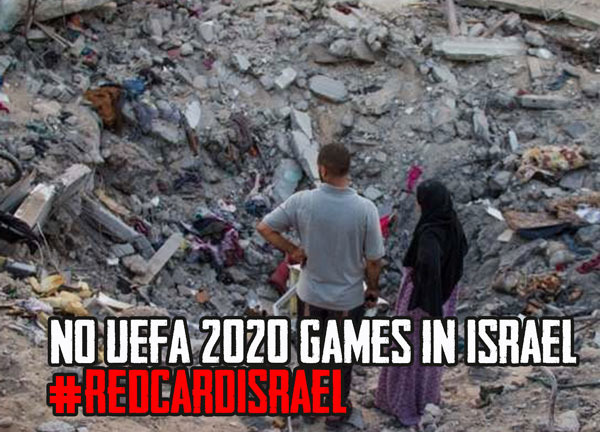 UEFA must live up to its stated commitment to human rights and show Israel the red card,” Abunahel added. Among those killed in Israel’s recent massacre were Ahmad Muhammad al-Qatar and Uday Caber, two 19-year-old football players at the start of their careers, and 49-year-old Ahed Zaqout, a footballing legend in Palestine known as “the voice of football” for his live commentaries. 32 sports facilities and around 500 athletes' houses were also damaged. The letter to Platini also warns UEFA that allowing the Israeli Football Association to host UEFA 2020 games in Jerusalem would legitimise Israel’s forced displacement of Palestinians from occupied East Jerusalem, which is recognised as occupied Palestinian territory by the EU and UN. Israel recently announced plans to further expand illegal Israeli settlements in East Jerusalem, a step that the UN and other agencies have warned will lead to further expulsions and forced evictions of Palestinians from their homes. There are virtually no football facilities in East Jerusalem and it is almost impossible for Palestinians to play football, because of the severe Israeli restrictions on Palestinian space and development. “If UEFA decides to allow part of its football tournament to take place in Jerusalem, it will be providing tacit support to the serious violations of international law that Israel is committing in the city”, said Abunahel. The Palestinian FA has previously called for the Israeli Football Association to be expelled from FIFA over its failure to protest Israel’s attacks on Palestinian sport. Israel’s military forces routinely attack Palestinian footballers and prevent them from travelling to games and training. Two teenage aspiring professionals were deliberately shot in the feet by Israeli forces earlier this year while travelling home from a training session. In 2010, UEFA president Michel Platini said: “Israel must choose between allowing Palestinian sport to continue and prosper or be forced to face the consequences for their behaviour". Platini and UEFA are expected to face months of intense protests and controversy if they decide to award Israel the right to host UEFA 2020 games. In a public letter protesting against UEFA’s decision to allow Israel to host the Under 21 tournament in 2013, more than 50 footballers including Didier Drogba and Frederik Kanoute called the Israeli-hosted tournament "a reward for actions that are contrary to sporting values". A major UEFA function in London was disrupted and there were pitch invasions at games across Europe in the lead up to the tournament.